Dear Reader, I’m pleased to announce that the case of the troublesome staircase has finally been resolved. The staircase was re-opened sometime between late January and February, albeit wrapped up in black-and-yellow sticky tape. Susie from London Transport never got back to me, but at least travellers could resume their new year’s resolution of getting healthy by using the staircase once again. If the staircase were a software application, then the sticky tape would be a testament to a poor design and even worse engineering as somebody somewhere probably decided that Test-Driven Development would be a) too much hardwork; b) not worth the while; c) TDD, what’s that then? or d) all of the above. I felt relieved then disappointed when I first saw the staircase covered in snaky yellow-and-black sticky tape. I figured back then that that was as good as it was going to get. That the tape was there to stay. 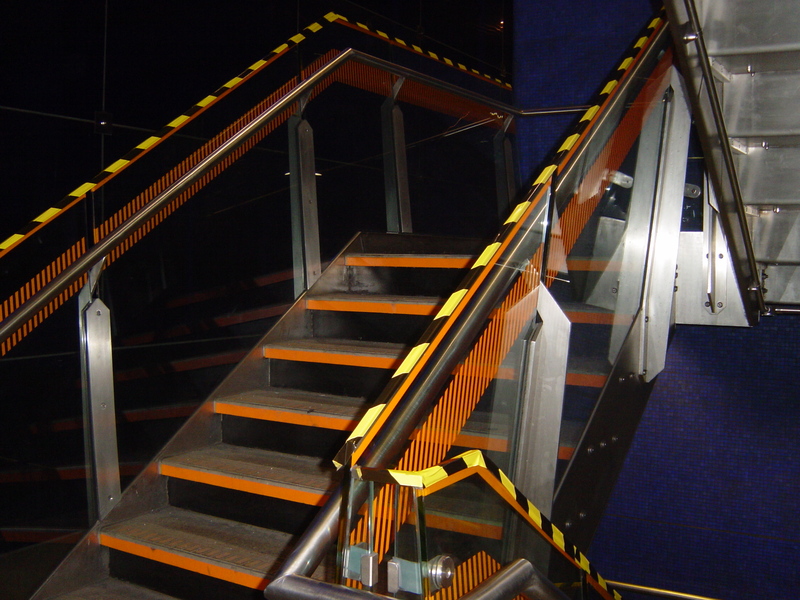 The tape was going to be testament to rubbishy British design and engineering everytime I used the staircase. ‘At least you can use the stairs now!’ I hear the optimists among you valiantly volunteer. And you would have been right. So you can imagine my surprise today when I discovered the black-and-yellow tape had been replaced by a ‘proper’ solution: the tape has been replaced with metal casings that run along the length of the rail of the entire staircase. Well, almost. It seems the team responsible for implementing the proper solution struggled with the use of their measuring tape which means that there’s still around 10 centimentres of the railing covered in black-and-yellow sticky tape in one corner. I wonder what else that team is responsible for putting right. And what about the architects and implementers of the staircase design – what do they do now? Do they know about their design failure? Is this really a happy ending? The entry 'Andon du Jour – London Underground Part Trois – The Grand Finale' was posted on March 29th, 2008 at 9:18 pm	and last modified on January 3rd, 2009 at 12:25 pm, and is filed under Esoteric Minutiae, Kaizen. You can follow any responses to this entry through the RSS 2.0 feed. You can leave a response, or trackback from your own site.